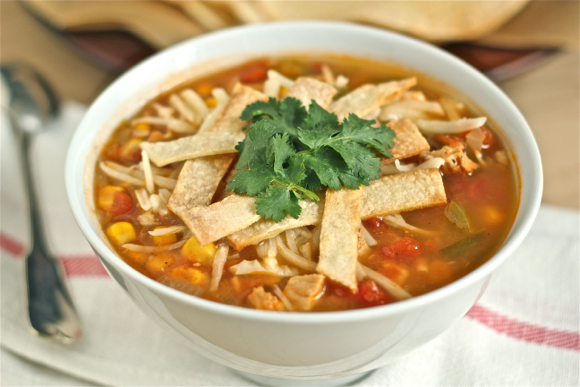 Confession: I had never eaten tortilla soup before I made this recipe. Another confession: This is not surprising, as there are lots of things I have never eaten before. I, probably like many of you, will often read a description of the dish or list of ingredients, think "eeew!" and then never give it another thought. Lately, I've been learning that my judgmental nature has cut me off from some pretty good eating. In reading a recent issue of a popular food magazine, I was drawn to a photo and recipe for tortilla soup; it was gorgeous and looked delicious. Then I read the headnote. What made this one noteworthy, in the magazine's view, was the chef's secret substitution: instead of tortillas, he used butter. An assload of butter. I think it was an entire stick. What the ... ? Wouldn't that then be BUTTER SOUP? I don't know about you, but when I want a little crunch alongside my sandwich at lunchtime or a vehicle to scoop up some yummy guacamole, I DON'T GRAB A STICK OF BUTTER. Needless to say, I didn't make that recipe. But it did prompt me to explore some other non-buttery, might-actually-contain-tortillas tortilla soup recipes. What I found led to me believe that this was a perfect candidate for the slow cooker. Not only that but, without adding the freakin' stick of butter, the soup is on the healthy end of the food spectrum, particularly if you make your own tortilla strips, rather than using the processed kind from a bag. So put down that stick of butter and fire up the crockpot: soup's on. As written, this recipe makes enough soup for about 4-5 people (or two, with leftovers). Feel free to double it; no need to adjust the cook time. Just before the soup is finished, preheat the oven to 400 degrees. Place tortillas on a parchment-lined baking sheet. Using a brush or oil sprayer, barely coat each side of the tortillas with a little bit of olive oil. Bake for about 20 minutes (turning them over once, if you remember) or until crisped. Break into pieces. Top each serving of soup with some tortilla "chips", cilantro and cheese. 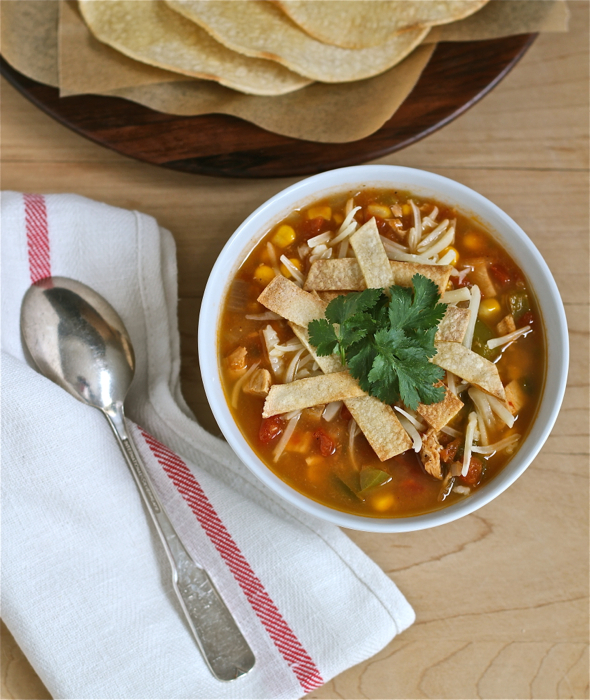 You are my hero--I love chicken tortilla soup but there are so many recipes out there I just didn't know which one to try. Although I'm sure I would have ruled out the butter one. ??? And in the crockpot? Dream come true!! Thanks, ninj. Happy to oblige! 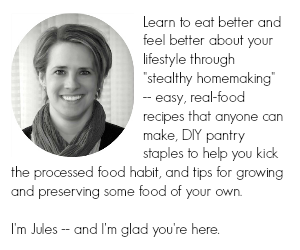 Let me know what you think of it if you make it. I finally made this soup, and it was great! Pretty spicy, but had a nice flavor and of course it was super easy. I used some leftover grilled chicken and leftover fresh corn, which I have fairly often so I'll be making this again I'm sure. I just wish I hadn't forgotten to make the tortilla chips before the family sat down to eat, so I had to make due with some baked chips from the store. It was fine, but I bought those corn tortillas so now I'll just have to make them separately.